My review today is for a cigar that was given out at the "White Party" at the 2012 Procigar Festival. 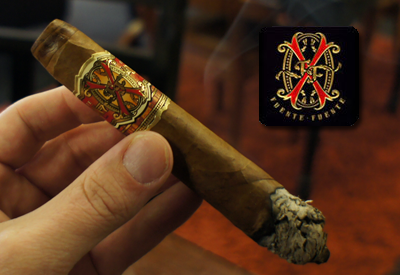 Something very special about the 2012 festival was that it was the first year that the Fuente family (the makers of this cigar) were back as full members of the Procigar organization. Luckily for us, we got to add their line of cigars we were able to smoke during the fest. Now I am far from an expert on Opus products, but I'm going to give a shot at what this cigar was all about. I was told that this BBMF is different from the BBMF that was released in the special Opus coffin gift sets. This BBMF is reserved just for hand outs at big Fuente events or now the Procigar Festival. One difference you can see right away was this cigar didn't have the secondary banding. I was also told that the BBMF was a stronger (or maybe the strongest?) Opus blend produced. Again, I'm not an expert, so maybe someone can leave a comment with more information. 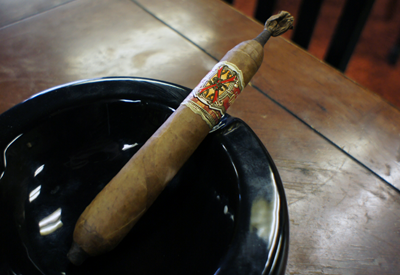 The BBMF is a prime example of one of the crazy, creative shapes Fuente makes for its special or limited releases. (To see some of the other shapes, check out the well-known site Vitolas.) There was a darker colored leaf at the tip of the foot of the cigar and also wrapped around what I would call a brush end cap. I'm sure there is a correct name for that style of cap, but I don't know what it is. After you get past all of the added extras, I'd describe the actual cigar as a well-shaped Figurado. The wrapper was medium brown in color and had zero visible veins. The pre-light aroma was faint, but smelled of some natural sweetness. The cold draw, on the other hand, was very strong and had a lot of fruity tastes to it...lots of raisin and date flavors. First thing I want to mention in the second third is something that went for the entire cigar. This stick had one of the flakiest ashes I've ever had. Just lifting the cigar from the ashtray to my mouth, I would see bits of ash float off into the air. The flavors in the second third were dominated on the front by the sweet honey taste with that wheat taste on the finish. Unfortunately, just like the first third, the burn issues continued in the second third. I had to correct this cigar about every five minutes, as it just did not want to burn evenly on all sides. It was frustrating, to say the least, when smoking a cigar of such high expectations. The strength of the cigar did increase a bit and I would put it in the medium to lower full range. Well something from the cigar gods happened at the start of the final third and the burn on my BBMF straightened out. Not only did it burn better now, it also tightened up on the draw a bit and I could get much larger clouds of smoke on each puff. Because of all of this the flavor, it increased a lot in strength. With that said, it was still the same flavors from the first and second third, just stronger on my palate (honey and wheat.) 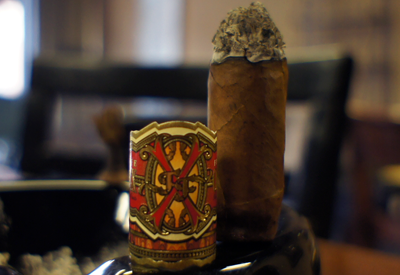 This was, by far, the best part of the cigar and thanks to that, I enjoyed this smoke down to the nub. The nicotine strength stayed in the lower full range. 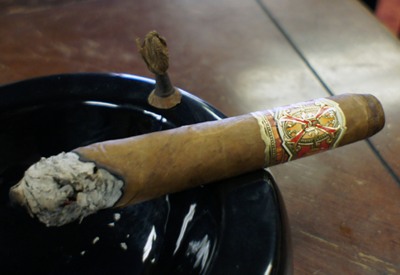 Final thoughts on the Opus X BBMF? When the cigar performed correctly it had a basic, but nice flavor. When it didn't burn or draw correctly, it was incredibility annoying to smoke. 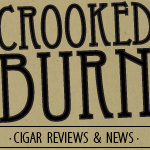 Correcting a burn on a cigar is no big deal, but constantly feeling like you have to babysit it or it's going to go out/tunnel is another thing entirely. I'd like to smoke another one to see if mine was just a dud, but I don't see that happening anytime soon. 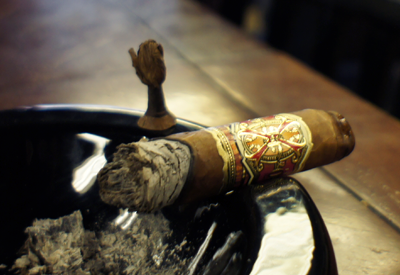 I'd stick with the more traditional Opus X releases if I was paying the top dollar these demand.